The wall may be a lot of things to many people.but to compare it to the Warsaw ghetto is outrageous..even you,rabbi must realize that. I don’t believe it is outrageous at all to compare Bethlehem to the Warsaw Ghetto. The graffiti read: “Bethlehem look like the Warsaw ghetto.” It did not say “What Israel is doing to the Palestinians is exactly what the Nazis did to the Jews.” And in truth, Bethlehem does in many ways resemble the Warsaw ghetto inasmuch as it represents an attempt by an occupying regime to control a specific population through the restriction of their movement. It’s interesting that in all the places I’ve read about the Pope stopping and praying here, I don’t recall one mention that this is a place he CHOSE to stop when he saw the graffiti. Thank you for writing this, Rabbi Rosen. 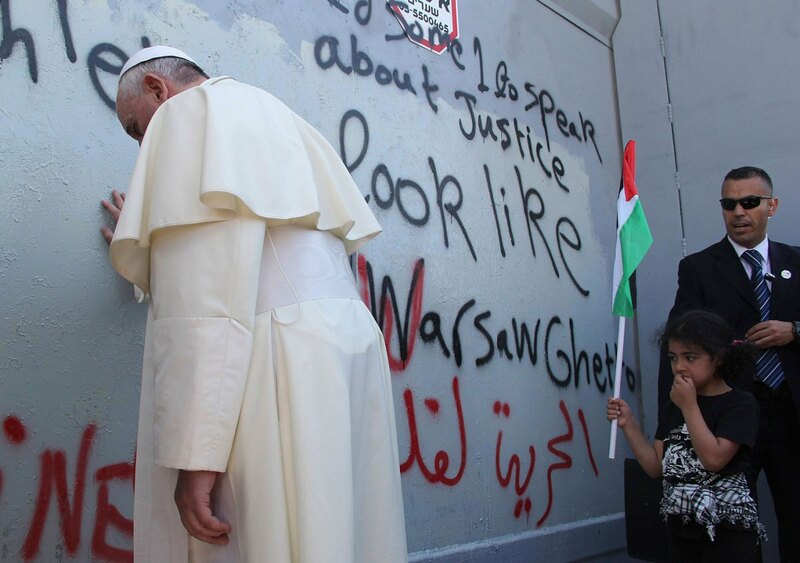 In all the places where I have read about the Pope’s visit to Bethlehem and have seen this photo, you are the first one to mention that it was Pope Francis who stopped the vehicle at this location when he saw the graffiti. Thank you for posting this. I’ve shared and reflagged it. let god hear his prayer!!!!!!!! Reblogged this on Project Peace. The effects of that prayer at the wall have been electrifying. I went out at about nine in the morning, wanting to see if I could get into Manger Square even without an entry card for Mass, and hoping to at least see the Pope arriving if I couldn’t go into the square itself. I had a presentiment that I would get to that Mass, and I did – a stranger in the Old City handed me a ticket! – so I was one of the nine thousand people waiting in the square when the Pope drove past ‘Aida. So I didn’t find out what he’d done until I went into the greengrocer’s on my street later that day. The greengrocer and his daughter, both Muslim, were discussing it animatedly. I don’t think I’ve ever seen them so excited. (I myself was excited enough to absent-mindedly buy the wrong vegetable and come home with a red cabbage instead of a beetroot.) Everyone I’ve spoken to here was so profoundly moved by what he did. It has been especially good for the children. I work with kids who struggle to see themselves as mattering at all: a couple of weeks ago a girl whose elder sister is traumatised and very unwell mentally began sobbing and said that after seven decades of nothing getting any better for anyone, how can she believe that things will ever get better for her sister? Does her sister matter that much? Something that the kids here often tell me is that nothing gets better, no one listens to what they have to say – and then the pope stopped his car and got out to read what any of them could have written, as though they were important people now, real people, not just ID numbers and a biometric handprint on an army database. I am getting a bit tearful just from remembering how happy and astounded they were, all because a man read some writing got down from his car to pray. I know that he has provoked outrage and disbelief on the other side of the wall, but I hope that he’s also provoked some curiosity at least, so that people ask themselves what the graffiti-sprayers needed him to know about, and what the wall might be hiding from their sight. Pingback: May 28th, 2014 « Tikkunista! i use this vehicle to comment on your recent departure from your synagogue. i unequivocally laud you for your insight and courage in facing the debacle of palestine-israel. among your many remarks standing out for me is this, paraphrased: “until operation cast lead, i’d look at the situation in palestine-israel, throw up my hands, and say, ‘it’s complicated’. after cast lead, it’s no longer complicated.” may you continue your profound ministry in other ways. i look forward to learning more with you.